When people ask me what my favorite thing is about REAL SIMPLE, I often mention you – our loyal reader. So, to thank you for your dedication, we’ve created a special new bonus program called REAL SIMPLE Rewards. Each month REAL SIMPLE editors will be sharing tidbits that you won't find in the magazine or online, like a peek behind the scenes or insider tips. Plus, share your own tips and you could be featured in Your Words – we’ll be spotlighting lucky Rewards members in future issues! 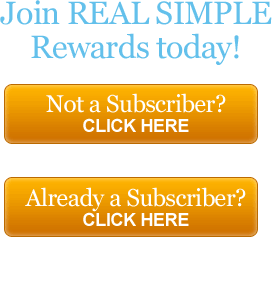 Just subscribe or register with us at the right and start enjoying REAL SIMPLE Rewards. We hope you enjoy this new program from REAL SIMPLE Magazine. Log in using your mailing address exactly as it appears on your mailing label. So that we may better serve you please choose which email address you would like on file.